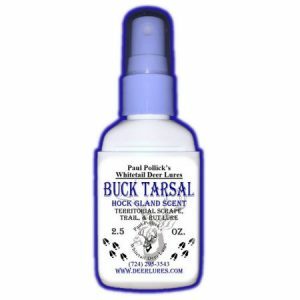 If Pollick’s Buck Preorbital doesn’t increase the deer traffic to your trail cam, simply send the product back to us and receive 100% money back on the item’s purchase price (Excluding shipping & handling). Extracted forehead, tear duct, ear gland and wax, mouth and lip saliva. 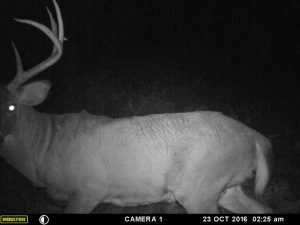 Early in pre-rut as buck are traveling together they state their dominance by rubbing, chewing, licking and then smelling their epidermal glandular scents and saliva pheromones. Buck are instinctively programmed to open communal licking branches in their core travel areas. 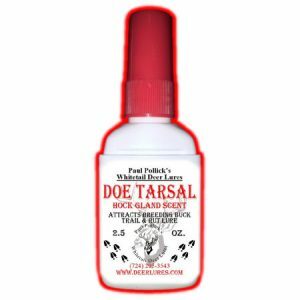 This scent establishes their natural “pecking order” in the progression to the coming rutting season. 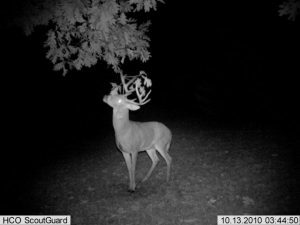 It is the number one scent of interest to buck when seeking out does for the upcoming breeding season. 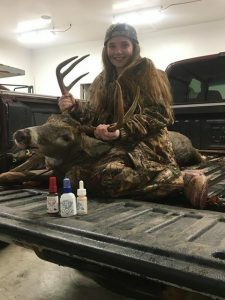 Buck Prorbital head gland scents placed on a few broken branches above mock or natural buck scrapes with a little of your favorite deer urine placed beneath it, will make the scrape appear authentic. 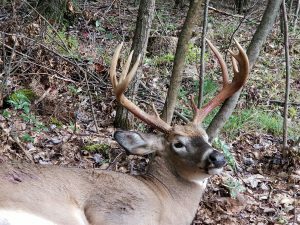 Buck Preorbital can also be placed on a sign post mock tree rub nearby with a connecting trail of Buck Interdigital or Buck Musk and Urine. Contrary to the claims of my competitor, his Preorbital gland lure is NOT “the only one that works”. 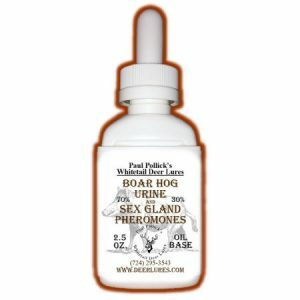 Pollick’s Preorbital gland scent has been on the market since 1995 with great success throughout the US & Canada at a fraction of the cost of our competitors (roughly 60% savings). 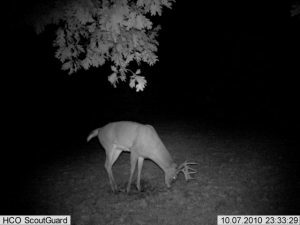 If you use multiple trail cameras throughout the season, you can’t afford NOT to give us a try! Pollick’s is also the only supplier of Preorbital scent in larger sizes (8 & 16 oz.) for even greater savings! Hope all is well in the Burgh. 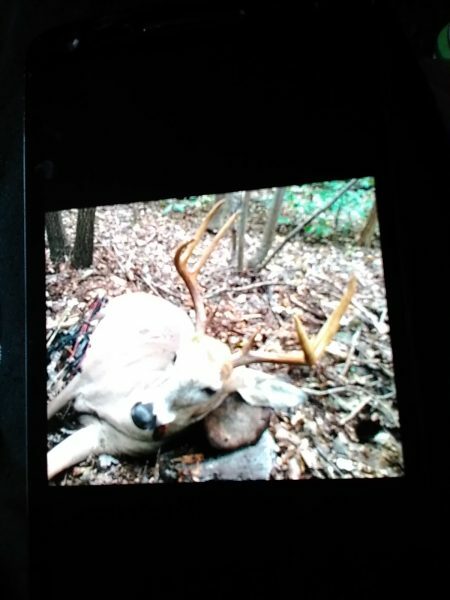 I finally connected on one of my target bucks on public land here in Maryland. 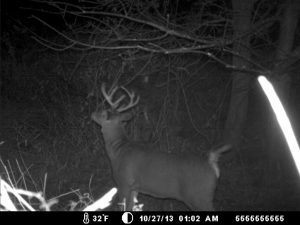 On Nov. 12 I was in a stand overlooking one of my mocks scrapes that I had set up using your buck preorbital gland lure. 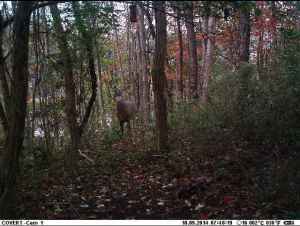 Prior to climbing into my treestand, I sprayed the scrape and surrounding area with your Flaming Doe urine. I also sprayed your October Cover Scent all around me, as the wind direction was less than ideal. 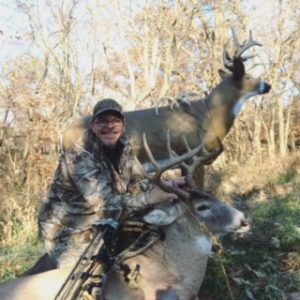 At 8:25am a nice 8-pointer approached from the south–directly downwind–but he never caught my scent! As he approached the mock scrape, he presented me with an easy 15-yard shot. I truly believe that my success was attributed to the use of your deer lures. 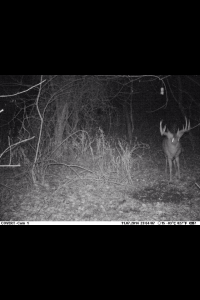 First off, I had this buck on camera visiting the mock scrape sight. 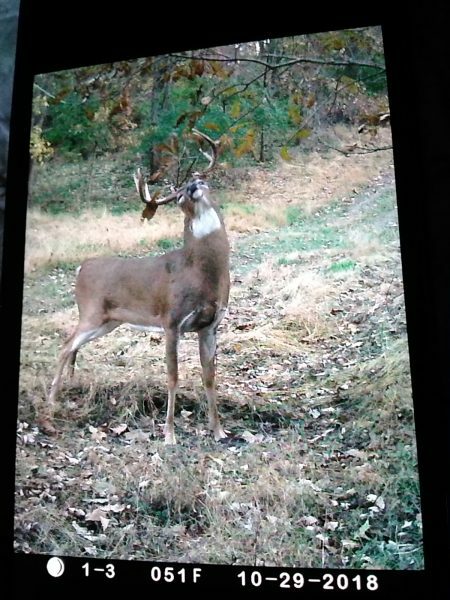 Second, without the use of your October cover scent, this big guy surely would have winded me and been gone. Thank you for your amazing products, Paul! As always, feel free to use any of this on your site. I did not get the shot on camera, but I will be putting out a video anyway. I’ll send you the link when it’s done. 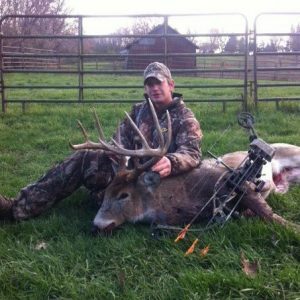 Here is my most recent buck I arrowed. I started using your Preorbital lures in August. 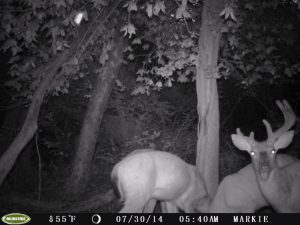 I put the doe pre-orbital about head high to a doe at mock scrapes I make. I put the buck pre-orbital a little higher. I do not put them both on the same branches. 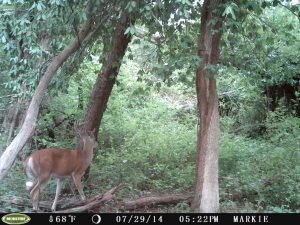 With the buck pre-orbital I make a trail by putting it on tree trunks that I rough up to look like a rub. I do this for a 50 yd. 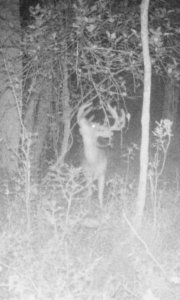 stretch past each of my stands. 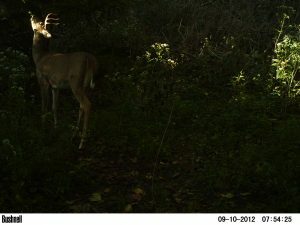 The bucks get used to traveling the route so come November I get to see a lot of deer right where I want them. 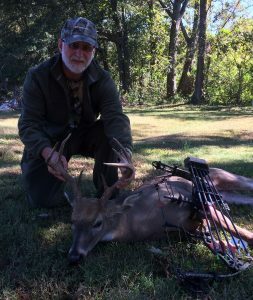 I use a doe in heat lure starting in November. I must put it at a mock scrape in a place that will not spook the does. Downwind of the doe trails. 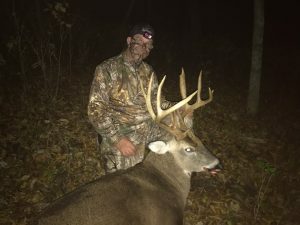 I only hunt public land but I see and harvest all the deer I need (4). PS. 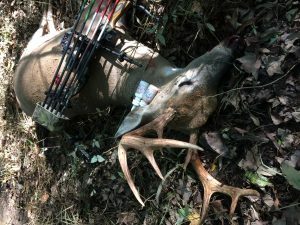 I only hunt with a bow. 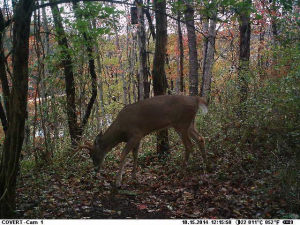 This guy came into the Buck Preorbital and Buck Interdigital scent I used on a mock scrape! Came in and tended the scrape too boot! 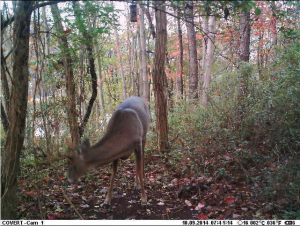 This guy came into the Pre Orbital and Interdigital scent I used on a mock scrape! Came in and tended the scrape too boot! 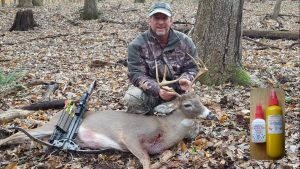 Here is the buck I harvested last year with the help of the Buck Preorbital and Interdigital Gland Lure. 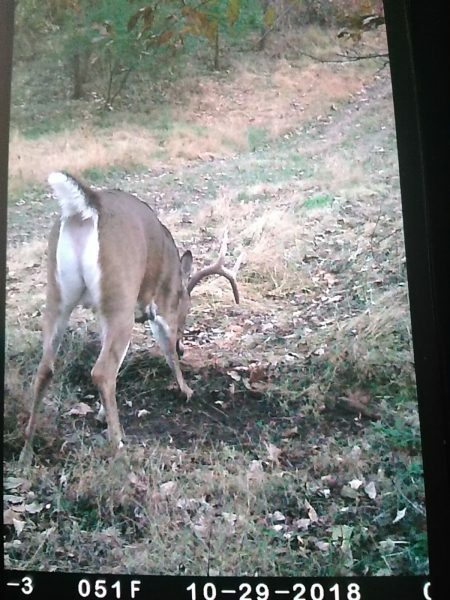 I wanted to send you a picture of this mature buck I decoyed in on Nov 8th. 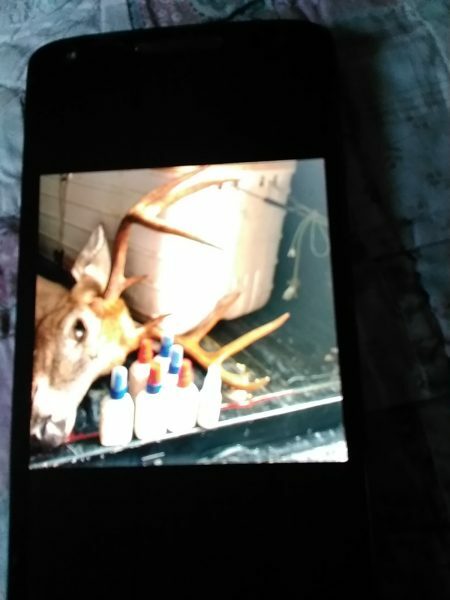 On the decoy’s antlers I put a piece of crumpled cedars branch soaked in Pollicks Buck Preorbital and on the south end I used a scent drag soaked in buck tarsal. This was an epic set with the excitement levels off the chart. 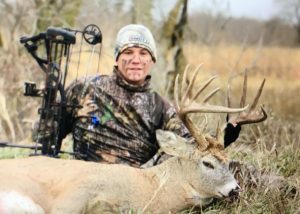 Thank you so much for a great product that has been a part of my bowhunting success for several years now. 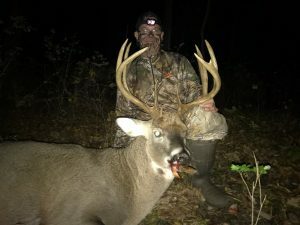 I live in southern Illinois and just tried your Buck Preorbital Gland Scent. I am completely amazed by this! 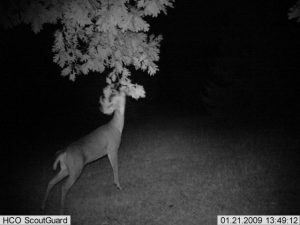 I set my trail cam and sprayed a small tree and had pics of deer within 20 min. Several bucks, big ones I’ve never seen before. Thanks for such a great product. I will be purchasing more and may try some of your other products. Just wanted to say thanks for your products and services. Shipped on the 20th had it by the 22nd, used it that day (Buck Preorbital) and got these. 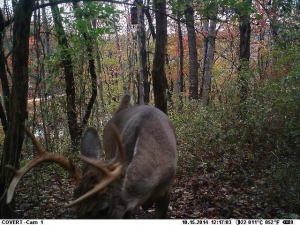 This is a new buck on the camera. 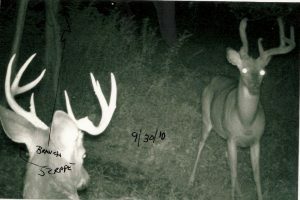 I had a bachelor group of bucks that stopped coming by my trail cam for a couple months. 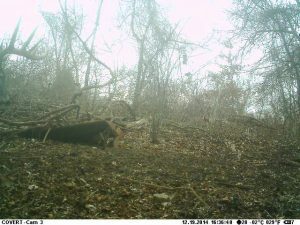 I used your Buck Preorbital spray in the ground in front of the cam and on a few branches above and within 24 hours of using it the bachelor group was caught on camera again and they continue to come back and pose for the camera. This stuff works! 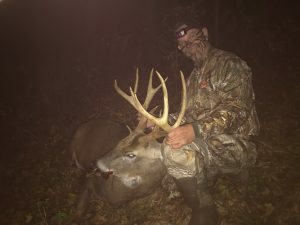 Ohio buck shot on November 1, 2015 at 4:00 pm. 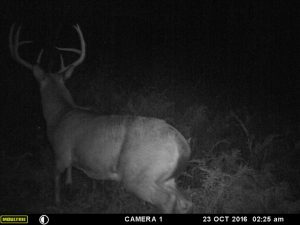 Checking a scrape with your Buck Preorbital Oil Base and Dominant Buck Urine. 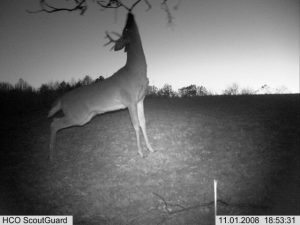 The activity on the scrapes with the combination of Preorbital and Dominant Buck was unbelievable. 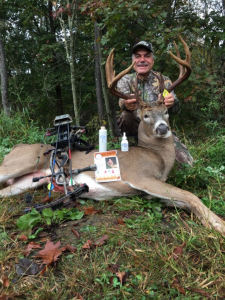 I am a believer in your products and will never hunt another season without them. 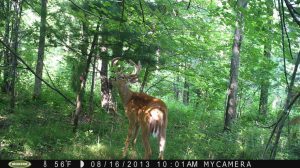 These trail camera pictures run in sequence from early season till December harvest. 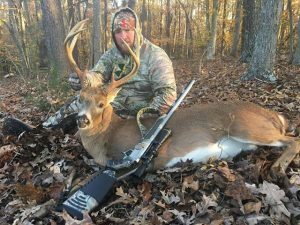 Dan Sum used Pollick’s Preorbital on the licking branch and Mystic Intrigue on the scrape in early season. 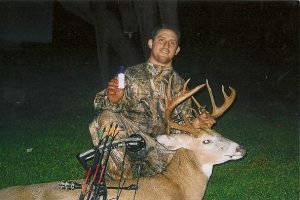 For the rut, Dan used a mixture of Pollick’s Buck & Doe sexual scents in the scrape. Once again the Pollick’s scent mixture I mix together year after year has helped me harvest my quarry. As you can see there are drippers in each picture (for the most part). I used the same mixture year after year. Same ratio of scents. The only thing I did differently in the early season is use your Mystic Intrigue instead of the sexual scents. I want to thank you again. 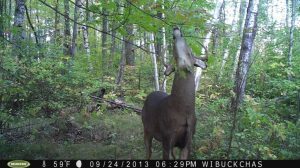 Buck reacting to Dan Sum’s licking branch using Pollick’s Buck Preorbital Gland Scent. 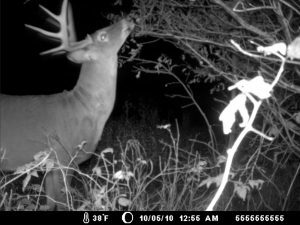 I have been a believer in your Buck Preorbital Gland Scent since the very first week I put it out in front of my cameras. 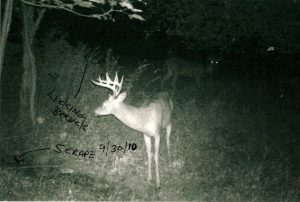 I make mock scrapes starting in late spring and don’t stop until after the bucks shed their antlers. 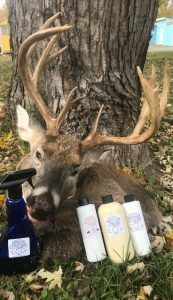 I have been using your scents for several years now and I have tons of pics and videos of bucks, does, and bears. The pre-orbital scent I ordered from you arrived 8-6-13 ( very fast service). 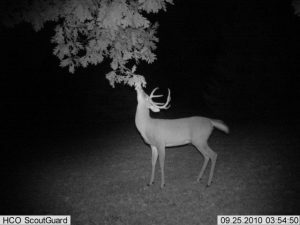 I have been very successful in past years in using an upright scent post instead of a mock scrape in attracting bucks. 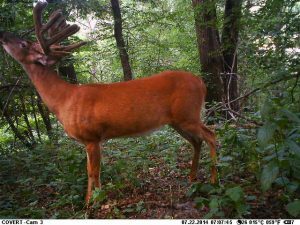 I find bucks like sumac. 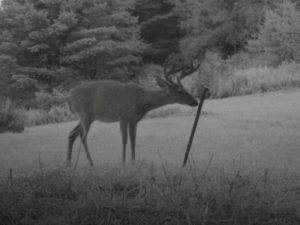 After velvet is shed bucks will rub the same posts. 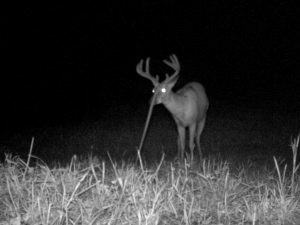 I sprayed your pre-orbital scent on the post and let the trail camera show me how the bucks respond. 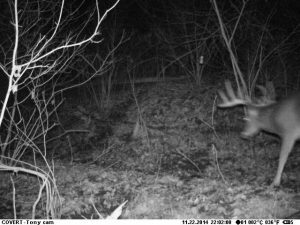 It wasn’t long and the large antlered bucks began showing up. Not only once but repeat visits to Pollick’s pre-orbital scent post. 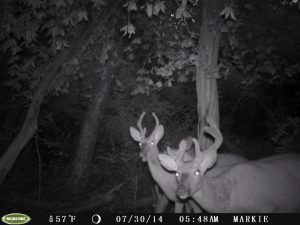 Attached are some images of bucks responding to your scent on 8-9-13 and 8-10-13. IT WORKS! 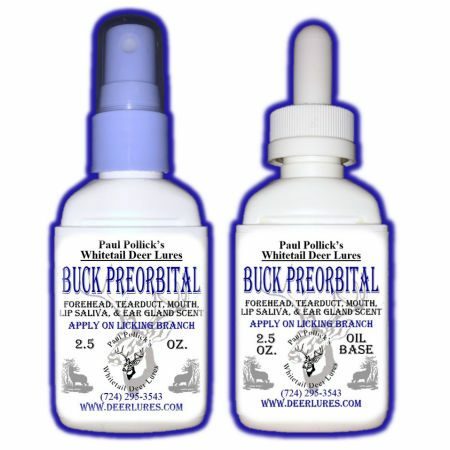 I bought Pollick’s Preorbital scent last year to try it after reading for hours about how and why it works. 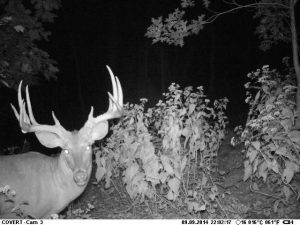 I have used more products than I can count, to not only harvest, but to get pictures of bucks in my area. 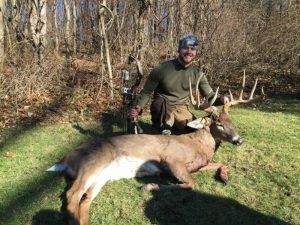 Pollick’s Preorbital scent helped me not only get more pictures but helped me locate and harvest this 178 3/8 witch is my largest buck to date with a bow. I’m extremely happy with not only your product but your costumer services. I will be buying more from you. Can’t thank you enough! Here are some pictures from 2010. 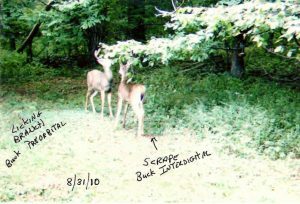 These are a few of many pictures where I made licking branch and scrapes using Pollick’s Buck Preorbital & Buck Interdigital. 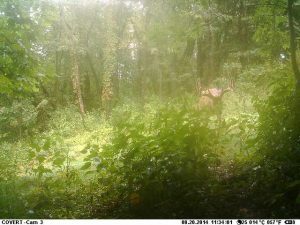 These trail camera pictures were taken by Mick Dombroski using Paul Pollick’s Buck Preorbital on the licking branch and Buck Interdigital in the scrape. 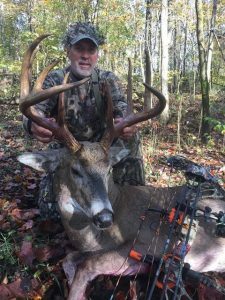 Russell Oliver’s 14 point taken with Pollick’s Buck Preorbital & Buck Interdigital!